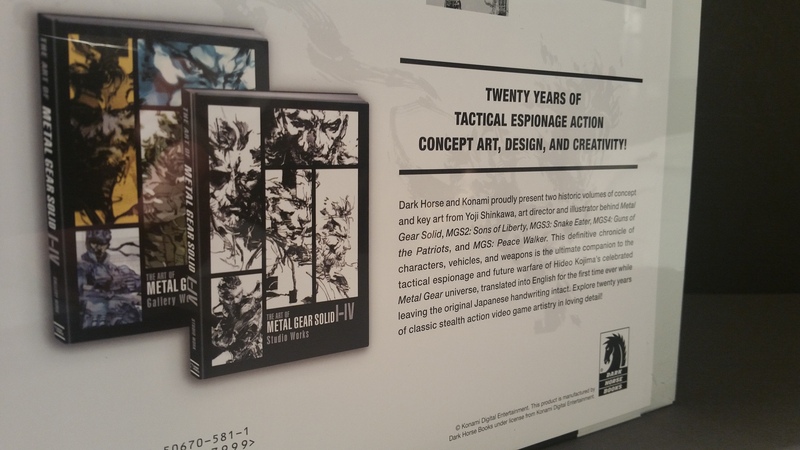 I’m a huge Metal Gear nerd. I’ve played almost every game in the series (except for MGS Touch, MG Survive, and the one time I got a chance to play Metal Gear Arcade, I couldn’t figure out what the hell I was doing), have beaten all the main series games (from Metal Gear on MSX all the way through Phantom Pain) and a couple of the spinoffs, and have a small collection of Metal Gear swag. I even have a Fox Hound logo tattoo! 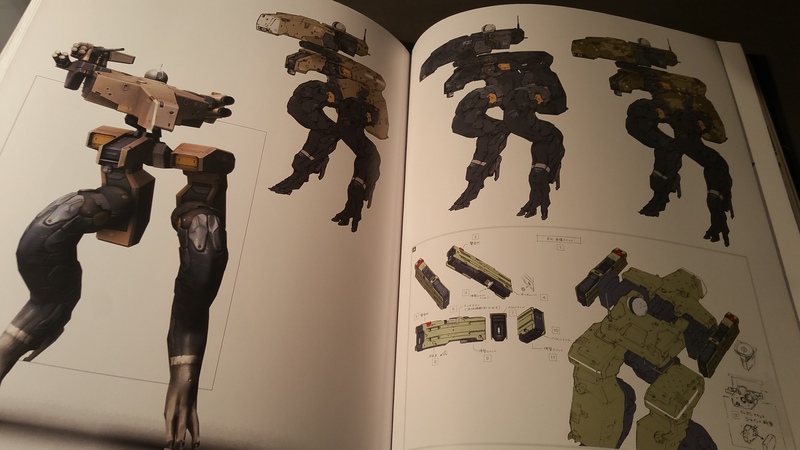 (The one from Metal Gear 2: Solid Snake, the same one that Meryl Silverburgh has in MGS1.) 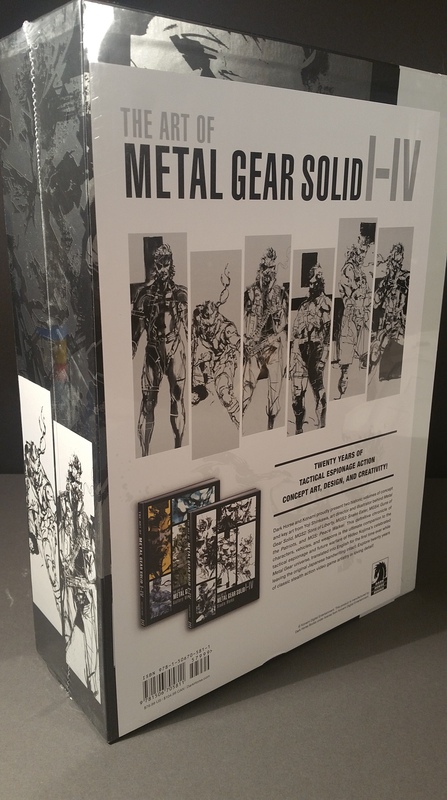 So it should come as a shock to absolutely nobody that when Dark Horse released this double-volume boxed behemoth called The Art of Metal Gear Solid I-IV, I had to have it. When my order showed up, it was so big, I thought they sent me the goddamned Shagohod by mistake. This tag team weighs in at a combined weight of about 12.4 pounds! Once I was done geeking out over the sheer heft, it was time to open it up and see exactly what’s here. The design of the packaging and the books themselves is striking. 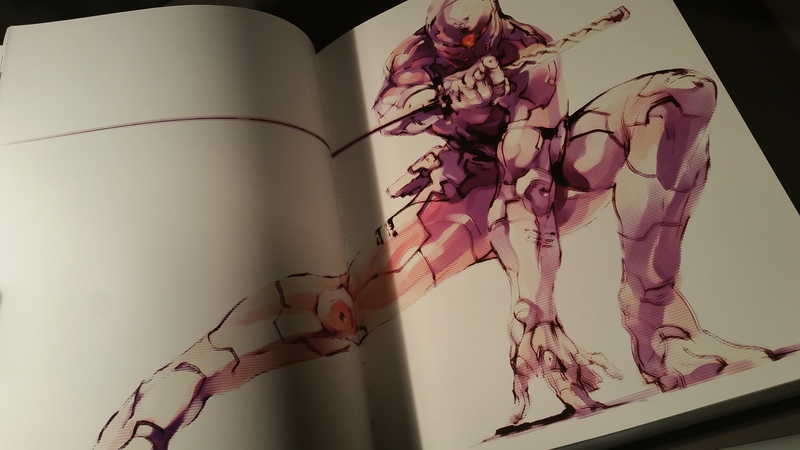 The slipcase opens along the side. I love the angled edges of the slipcase, giving the box a little hint of future-tech feel. As for the books themselves, the first thing you’ll notice is the stunning silver — almost chrome, in fact — edging on the pages. 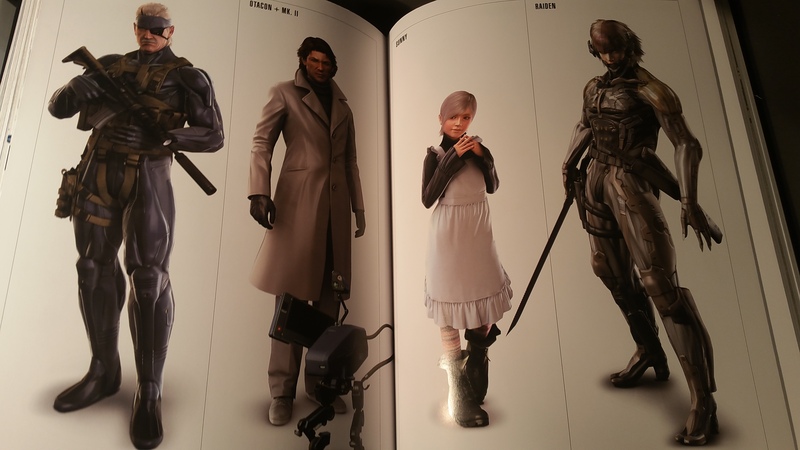 Finally released from their confines, the two books are titled “Gallery Works” and “Studio Works.” It should be noted that although the books are titled The Art of MGS I-IV, they also include work from Peace Walker. 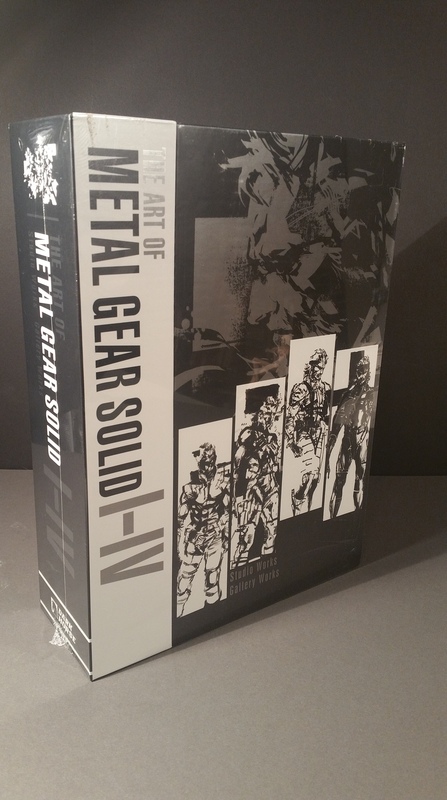 (There is a whole separate volume of The Art of Metal Gear Solid V, also available from Dark Horse, which is not a part of this review.) 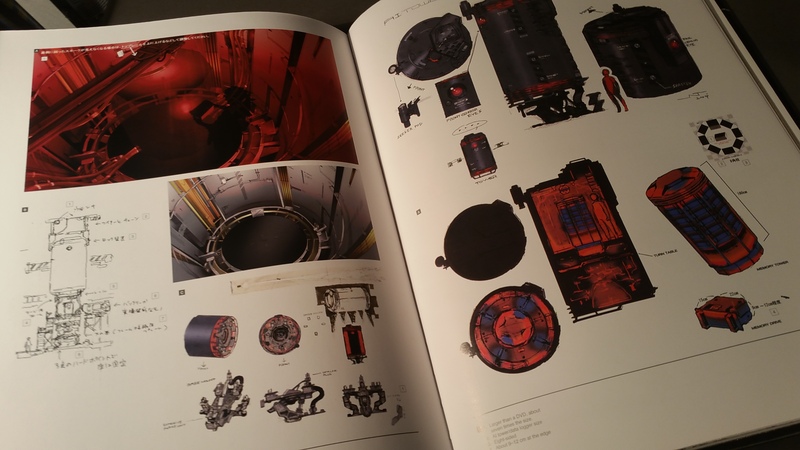 Let’s take a look at Studio Works first. 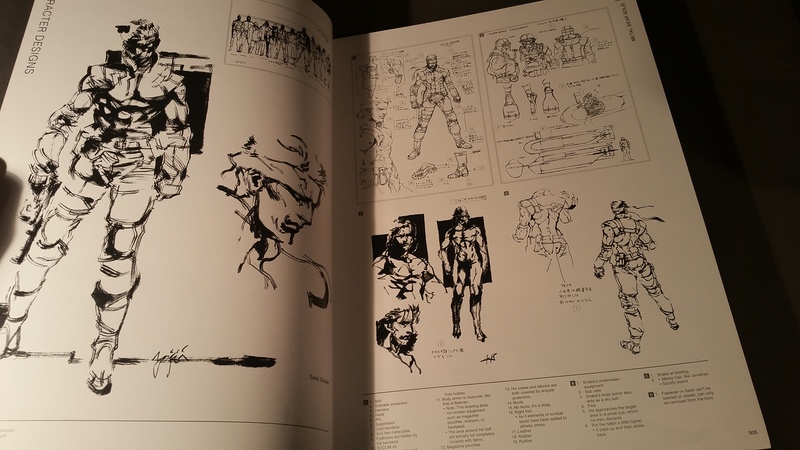 The Studio Works volume, at over 380 pages, is all sketches, character designs, and concept sketches of sets and machinery. 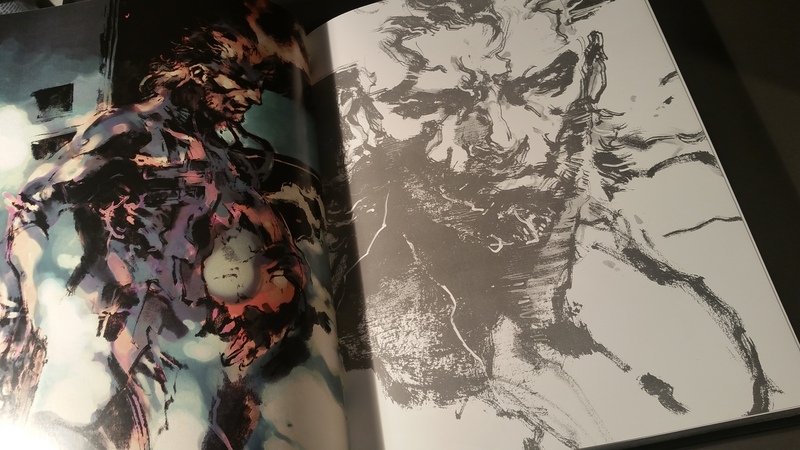 Gorgeous artwork by Yoji Shinkawa and others, it’s much of that loose, sketchy artwork that the series is known for, as well as more technical designs. It’s so cool to see the beginning stages of all these iconic scenes and characters. 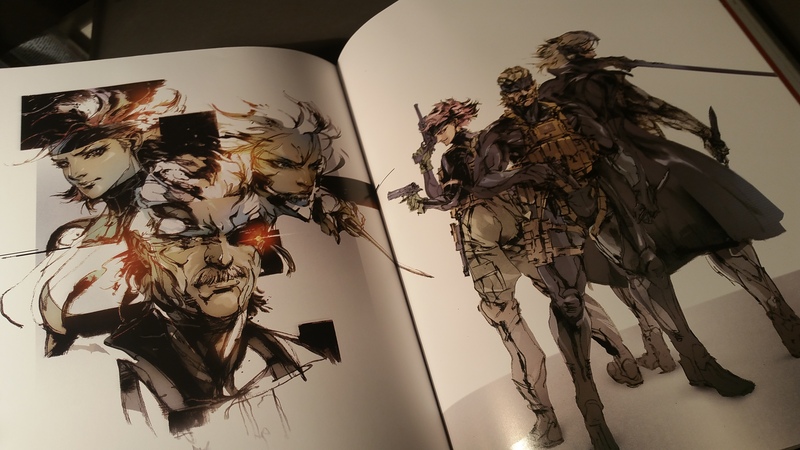 Moving on to the Gallery Works volume, this one boasts over 400 pages, and features finished color artwork, much of which was used on packaging and promotion, as well as CGI character art for some of the later games like MGS4 and Peace Walker. 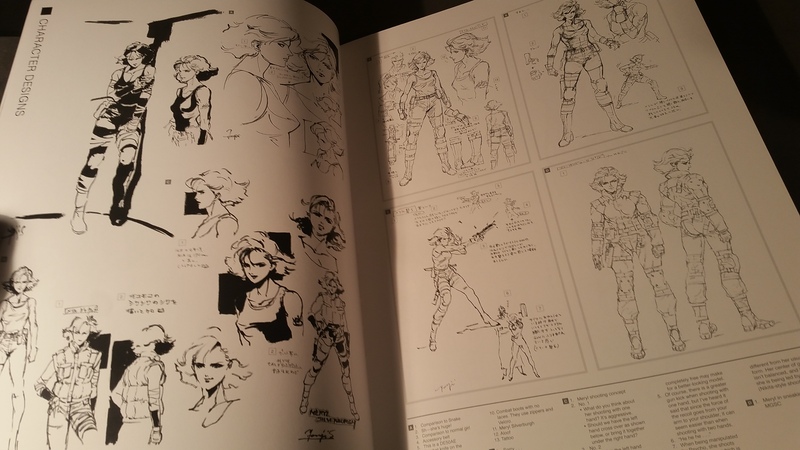 It’s hard to write too much about an art book — the best thing to do is just show it to you. 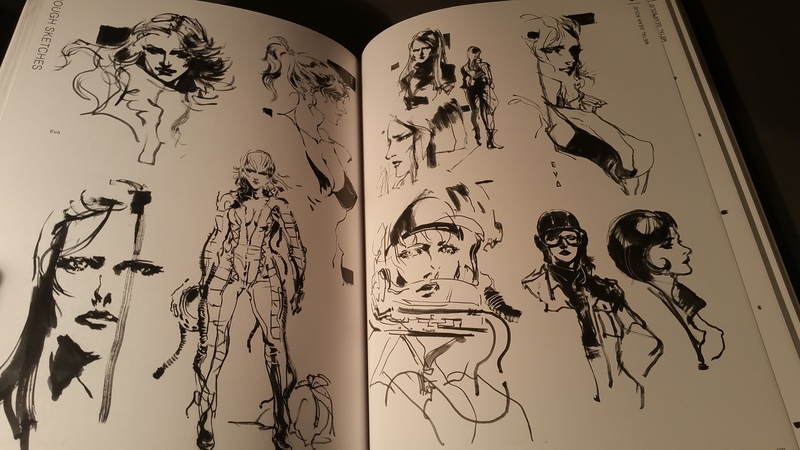 It also includes the comic-style cutscenes from Peace Walker! Of course, at nearly 800 pages total, I’m only showing you the tip of the iceberg. 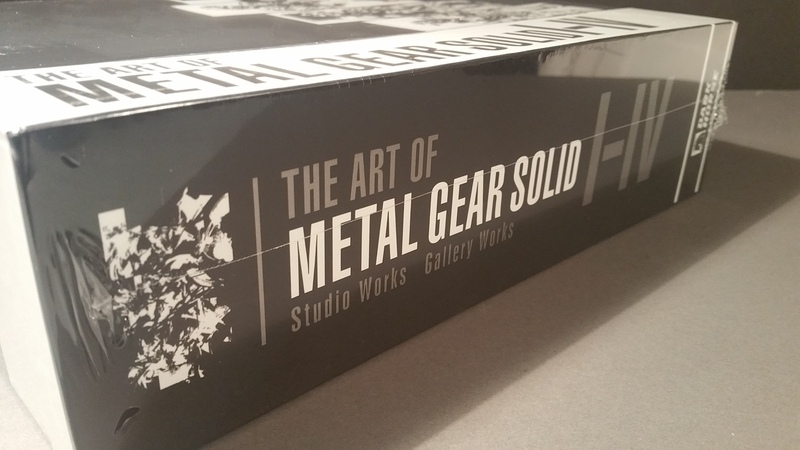 There’s so much to dive into here for the art-loving Metal Gear geek that it’s more than worth the $80 price tag (although keep a close eye on Amazon, as I watched the price fluctuate as high as $75 and as low as $54). 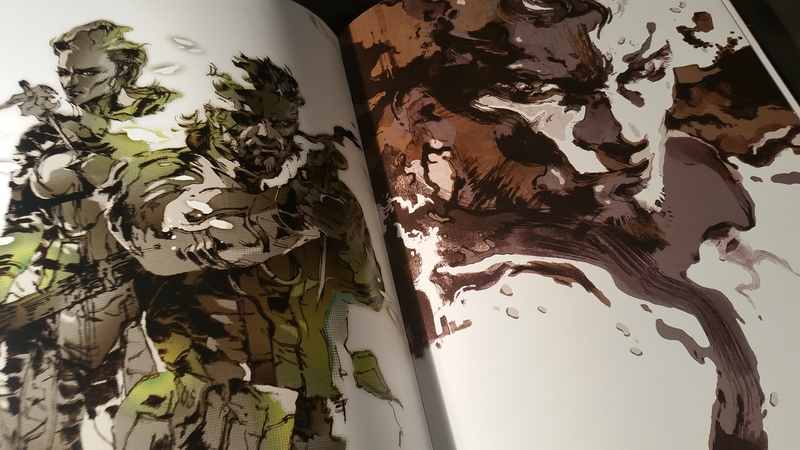 Along with their Zelda and Final Fantasy books, Dark Horse continues to deliver amazing value. 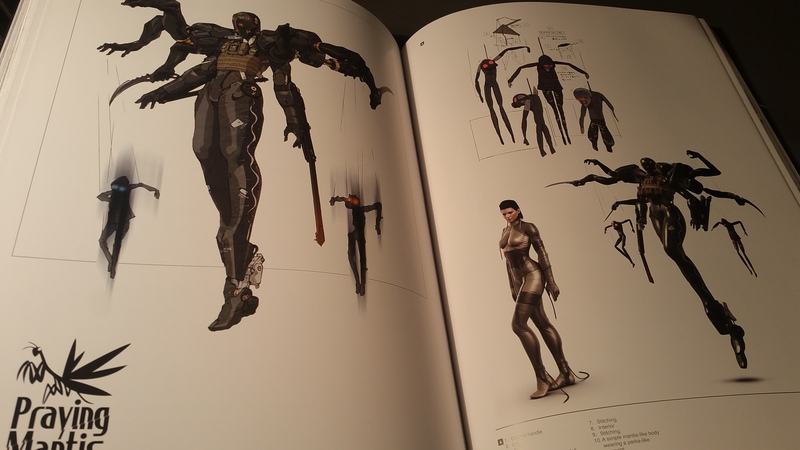 When you realize that some massive art books by publishers like Taschen retail for thousands of dollars, this much content in such a gorgeous presentation selling for under a hundo is a steal!